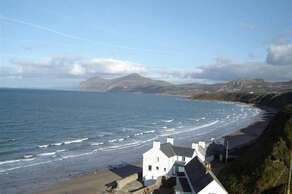 Yr Hen Felin - The Old Mill, B &B is within easy reach of Tŷ Coch - the pub at Porthdinllaen that has been voted the 'third best beach pub in the world' , the dramatic coastline of the Llŷn Peninsula, the old market town of Pwllheli and the varied and memorable delights of Snowdonia. The castles of the bygone Welsh Princes and Portmeirion village of the renowned 'Prisoner' cult series and wonderful Italianate architecture are only a short drive away. These can be enjoyed at any time of the year. There are numerous coves and beaches, either to sunbathe, swim or explore, within close proximity. There are ample good restaurants, pubs and teahouses in the area. Whatever the time of year it's easy to find something to fill your time on the Llŷn, be it swimming, sailing, archery, quad biking, ten pin bowling, clay shooting, winter and summer walking, horse riding, sailing, golfing and visiting various places of historical interest.